Jane Clarke's first collection, The River, was published by Bloodaxe Books in 2015 to both public and critical acclaim. She holds a BA in English & Philosophy from Trinity College, Dublin and MPhil in Writing from the University of South Wales. In 2016 she won the Listowel Writers’ Week Poem of the Year Award, the Hennessy Literary Award for Poetry, and The River was shortlisted for the Royal Society of Literature Ondaatje Literary Award. She was awarded an Arts Council Literary Bursary in 2017 for work on her second collection. Q: In your poem ‘Against the flow’ , the persona speaks about one day knowing “you must turn, / begin to swim against the current” in the hope of finding “a place in gravel and silt // to hollow a dip, / to spawn a life of your own.” Is what you describe here in any way analogous to how your poems find their voice and shape on the page? How did you come to write poetry originally? A: I like that analogy. It seems to me that the poet is driven by instinct or a primitive pull like the salmon, so that many creative decisions, including how the poem finds it voice and shape on the page, are not primarily conscious. The poem began as homage to the salmon, out of awe at the mighty journey it makes. But as I was writing, it also became a poem about the journeys we have to make to become, as it were, ourselves. For me that journey included “coming out” and stepping away from the values and beliefs of my family before finding my own way back to the river of birth and upbringing. I had the dream of “being a writer” when I was very young but I lost touch with it over the years. When I was training and working as a psychoanalyst in my thirties I began to read more and more poetry and in my early forties I attended my first creative writing class. I was initially interested in writing short stories but a requirement to write four poems ignited a passion that was as surprising and powerful as falling in love. The River was published ten years after I wrote my first poem. Q: Reading your poems, I am occasionally reminded of the work of other poets – of the delicacy of Moya Cannon, for example, or the lucidity of Gillian Clarke. Are you a reader of contemporary poetry? How has your ‘reading life’ (or indeed ‘listening life’, as the case may be) affected your style and concerns as a writer, do you think? And lastly, if you were to identify writers or other creative artists who have influenced your work, who would they be? A: I’m honoured that my poems would remind you of the wonderful work of either Moya Cannon or Gillian Clarke. I was extremely fortunate to have Gillian Clarke as a tutor for two years early on in my development as a poet, when I was doing my MPhil with the University of South Wales. 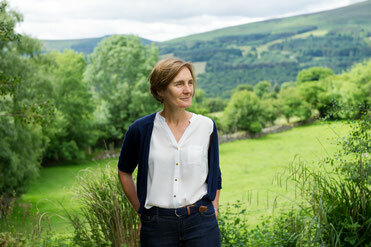 Moya Cannon is one of the many Irish poets who have inspired me. Yes, I’m an avid reader of contemporary poetry and I also love to reread the classics, such as Dickinson, Hopkins, Akhmatova, Donne. It can be difficult to pinpoint influences because it’s primarily an unconscious process. Also the longer I am writing the more I wonder if the most important influences were from very early in my life; my father quoting Hiawatha, the Protestant hymns we sang at home, the traditional songs we learned in national school, reading Kavanagh, Yeats, Dickinson, Frost, Shakespeare in secondary school, and reading Little Women, the novels of George Eliot and Thomas Hardy through long summers in my teens. Two writers were particularly influential by giving me a kind of permission to write out of my own life: Elizabeth Bishop and Seamus Heaney. They are both touchstones for me and I go back to their work frequently. There are so many others who have influenced my work since I began writing poetry that any list will inevitably be incomplete but the top twenty includes Emily Dickinson, W.B. Yeats, Paula Meehan, Czeslaw Milosz, Jane Kenyon, Kathleen Jamie, Jane Hirshfield, Adrienne Rich, Michael Longley, Lucille Clifton, Mary Oliver, Sinead Morrissey, Langston Hughes, W.H. Auden, William Carlos Williams, Ted Hughes, Eavan Boland. Q: It seems to me that your poem 'Who owns the field?' strikes a quietly oppositional chord in the era of vulture funds and market-driven housing legislation in Ireland, which has seen the intensified privatisation of land ownership and use (with far-reaching social effects). In a similar vein, perhaps, your piece 'Before the war' addresses the ongoing colonisation of Palestinian land by Israeli military forces. Can you comment on the political function of poetry, and of your own poetry, as you understand it? Am I incorrect to describe 'Before the war' as an address, for example? I suppose what I’m trying to get at is whether you think it’s possible or desirable to write a politically efficacious poem – or do the politics of a particular piece only come into play after other formal or creative requirements have been fulfilled, in your view? A: I believe it is both possible and desirable to write a politically efficacious poem but I also think it is very difficult to do so. Many of the poets I admire write powerful political poems, e.g. Suji Kwock Kim, Solmaz Sharif and Natalie Diaz, as well as poets like Jackie Kay, Carol Ann Duffy and Liz Lockhead. I believe the personal is political, so it seems inevitable to me that my political perspectives will influence my poetry. I was a community worker for many years and continue to work with organisations committed to social justice and human rights. However, I am wary of setting out to write a political poem because such poems can be sermonizing, self-righteous and lacking in subtlety. “Tell all the truth but tell it slant” applies to political poetry just as to any other poetry. Poetry’s power lies in what it suggests and what it evokes but also in simply bearing witness. I don’t try to deliver a message but I’m very happy if, by exploring what matters to me, I create a poem that expresses a political dilemma and sets off questions, resonances or new perspectives for others. I’m wary of talking about what a poem means to me because once it’s published what matters most is what it means to the reader. I love when readers see what I haven’t seen or consciously intended. 'Who Owns the Field' was inspired by the face, hands and stature of an older man I saw on a bus in London one day. I imagined he had been a labourer, which set me thinking about farm labourers and what they were left with after many years of hard work on land that wasn’t theirs. I had in mind a man I knew from when I was a child as I was writing the first draft. About a year later I thought of trying it in the form of a villanelle, which some say originated as a peasant working song. That’s when the poem took off; the refrains and the repeating rhymes required me to use certain language like “sheaves” which gave the poem a more archaic quality but also emphasized that this is a question that has been asked down the centuries and all over the world. Yes, 'Before the War' is a kind of elegy for Palestine and an attempt to express the tragedy of what is happening to Palestinians day in, day out, under colonization. It was written in response to poetry by Mahmoud Darwish. Q: While we’re on the topic of politics in your poetry, it seems that much of your work details the experience of women per se; that your poems are often animated by an attentiveness and sensitivity to the loss, pain, and sometimes solace peculiar to such experience, especially in Ireland. Is this a fair characterisation, do you think (or does it miss the mark)? I have in mind a poem like ‘In Glasnevin’, but also pieces included in The River such as ‘Enclosed’ and ‘Arctic Hare’, which describes a woman who “senses / when to find shelter” and “has learned to keep / a wide field of vision” in her life. Can you comment on these poems, and on this aspect of your work? Do you find yourself writing as a woman at all (perhaps even as an Irish woman)? A: I like the freedom to write from various personas but it seems inevitable to me that I write primarily as a woman. I spent three months in India when I was nineteen and it was there I came to understand feminism both intellectually and emotionally, as a result of seeing the impact of patriarchy writ large. I realized then that I had been observing the impact of inequality all my life on the lives of the women around me; grandmothers, mother, aunts, neighbours, teachers. I found myself writing about these women and how they coped, adapted, lived with loss and also thrived within the restrictions of their time. I very much like how you have characterized this as “an attentiveness and sensitivity to the loss, pain, and sometimes solace peculiar to such experience”. Growing up in a Protestant family in the west of Ireland in the sixties and seventies gave me the perspective of an outsider, as did the experience of being a girl in a setting that privileged the role of the man at home, in school, at church, at the fairs, in the marts and shops, on radio and television, and in the newspaper. 'Enclosed' is indeed a political poem for me, expressed in a personal voice. I was thinking of the many women who entered convents because of the lack of other choices or because of what they needed to escape. 'Arctic Hare' explores how girls and young women learn to be on the look out for danger, to protect themselves, to live cautiously. There is a common theme of all that could not be spoken but was hugely influential in the shaping of these lives. These are the issues that are being discussed more openly in recent public discourse. Q: I’m curious as to whether you find the compiling of a manuscript of poems to be a creative process. How did your book, The River , take shape? Did it happen quite naturally, for example, or was it more a matter of planning, of drafts and revision? And how does this compare to your writing process (if you have one in particular)? A: I was shaping the collection over a period of about four years. On reflection I see that the process is conscious and unconscious, rational and instinctive, like the process of writing a poem. Shaping a collection has all the trial and error of creativity, the risk taking, the questioning, the anxiety and excitement, the times of delight and the times of disappointment, the discoveries and the learning. At times I felt almost immobilized with anxiety about my collection, but I got lots of help from poet friends and colleagues. Their responses to drafts helped me step back and look at the work with greater distance, in the same way that feedback helps one look at one’s poem afresh. I tried lots of different ways of structuring the collection. At one stage I was considering having different sections but then I realized that I wanted a loose narrative flow throughout the collection. “Collection” is a misnomer in that it implies a gathering of all that we’ve written over a certain time. When you’re writing a poem a crucial part of editing is deciding what to leave out and it’s the same with a collection. Yesterday I was going through a list of poems that I have had published over the last three years and deciding which ones not to include in my next collection. We have to ask of each poem: does it earn its keep? Poets bring high standards to individual poems, making sure that every word is needed, and we should aim for the same standards in our collections. I’ve used the analogy of building a dry stone wall for writing a poem but it may be more apposite to the job of shaping a collection. You have all these poems spread out on the grass, different shapes and sizes, different age and colours, different themes and associations. So how do you choose and place one beside another to make something beautiful, meaningful and strong, a whole that is greater than the sum of the parts? Do you want to display them in a book as individual pieces (like pieces of art in a gallery), which is a valid approach, or do you want them to add meaning to each other, gain resonance from each other, provide a narrative thread through the book? How does this compare with my writing process? Elizabeth Bishop captures it for me: “There is a mystery & a surprise and after that a great deal of hard work.” There’s the magic of getting something going and I have to write quickly to catch it while it has that initial energy. It starts with a line that sounds musical to me, or a memory that somehow finds words, or an image that’s a way of expressing something I’ve wanted to express. There’s usually a strong emotional undercurrent, which gets tugged and brought to the surface by reading another poem, hearing something on the radio, or a conversation with my wife or friends. Sometimes I can’t even remember the spark that set it going. There are a few poems that come quickly and seem to have found their best expression but more often I do lots of drafting and redrafting, with the help of feedback along the way. It’s disappointing when a poem in which I’ve invested a lot doesn’t come to fruition. But I try to trust that all writing is worthwhile and is part of the process of finding and sculpting the ones that do work. There are always a few poems that are nearly there but not quite and I remind myself to give them time, let them percolate. If I can keep a poem in mind like a question that hasn’t been answered, I sometimes find, out of blue when I’m reading another poem or out walking, an image or a word that makes all the difference. Q: Especially since The River was published in 2015 , your work has earned the attention of a number of leading poets and writers (Paula Meehan, Anne Enright, and Dave Lordan come to mind as fellow craftspeople who are also public admirers of your work). Of course, The River itself has been something of a smash hit with reading audiences in Ireland and the UK. How have you navigated the role of the public poet which often accompanies such praise and attention? What has this role consisted of for you? Do you find any tension between personally accommodating the publicity your work has received and the more private demands of poetry (the writing of poetry) as craft? A: My experience since the acceptance of The River for publication by Bloodaxe Books is in keeping with how Kathleen Jamie put it in an interview, “If our poetry is engaged with, and received well by others, by readers and critics, their interest and engagement gives us the moral strength to permit ourselves to make further moves.” I am aware that a positive response to a first collection could lead to complacency. I hope I’m continuing to push out my own boundaries as a writer and maintaining a high standard of editing. The response to The River was and continues to be way beyond my expectations. There were times in the 18 months after my collection came out that I felt too busy with readings, travel, judging competitions, responding to emails, requests for new poems for publications, requests for reviews, updating my website and social media, doing interviews... as well as working part-time for a living. It was difficult to get the quiet, uninterrupted time I need for my reading and writing. But I reminded myself that this exciting, super-busy time wouldn’t last. It’s a privilege and a joy to have an audience for my work. I value the opportunities to read my work in public and I enjoy the interaction with readers. I find the stimulation of hearing other poets and readers’ responses grist to the writing mill. While I am unequivocal about wanting my work to be widely read, I believe it’s important to distinguish between promoting my work and promoting myself. I feel very strongly that the poems are not me. I need that distance to feel free to create poems that are separate from me whilst, of course, drawing on my life for inspiration. For me there is a community aspect to the role of poet. I have a sense of working within a community of poets in Ireland and the UK, a broader community of writers and an even broader community of artists. I couldn’t begin to list the number of ways other writers have helped my development as a poet, directly and indirectly. I have experienced great generosity in this community and I hope that I contribute to the community in turn.